Group size is six participants. This educational adventure is suitable for kayakers with experience. The Evolution Expedition is a seven-day course designed for prospective certified guides, as well as intermediate kayakers seeking to develop their expedition capabilities. Participants enjoy daily opportunities to learn from practical experiences while kayaking and camping in this world-renowned wilderness destination. The Evolution course explores a route similar to our Waters of SGang Gwaay tour. 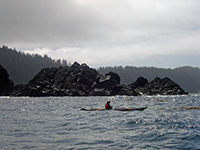 During the course, we paddle offshore to visit the extraordinary ancient Haida village of SGang Gwaay (Ninstints). Please see the course itinerary. Each day, numerous challenging and instructive opportunities are facilitated. Our curriculum is comprehensive and our guide instructors are talented educators. The wealth of experiential knowledge conveyed and practiced during the course enables each participant to significantly boost their skill level and confidence. This course is not designed as a paddling holiday. 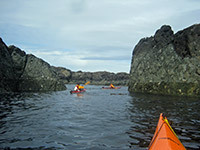 The Evolution course enables participants to learn highly practical leadership skills and proven guiding techniques from some of the most experienced ACSKG certified guide instructors on Haida Gwaii. The proficient leadership skills covered during the course can be successfully applied to many aspects of everyday life. Learn to correctly assess situations and accurately evaluate options. Practice your ability to reach sound decisions. Learn when and how to appropriately defer decisions. Discover methods of communicating clearly and concisely with a group, while carrying the responsibility and privilege of leadership. The Association of Canadian Sea Kayak Guides endorses our program. Upon successful completion of an Evolution course, participants may apply for ACSKG assistant guide certification. We also host ACSKG full guide exams. ACSKG certificates are recognized worldwide by a multitude of companies and agencies. ACSKG certified guides professionally lead expeditions throughout the world. The Evolution course is not designed as a paddling holiday, please see the prerequisites. For additional training, please consider our guide apprentice program. 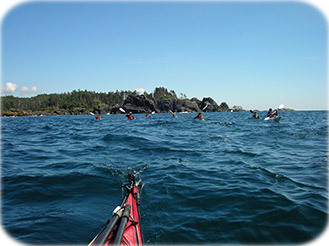 We also offer kayak guide courses on British Columbia's Sunshine Coast. Join us for an unforgettable educational adventure. 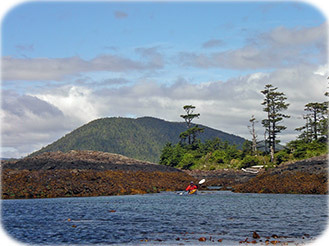 Four advance registrations are required in order to confirm the Haida Gwaii Evolution course. If you are interested in this unique journey, please consider making reservations well in advance.